Mixed Media 24" x 48"
I'm very inspired by the saints that seem to have such a presence here in New Mexico. When I first visited Santa Fe in 1994, I went to the Cathedral Basilica of St. Francis of Assisi in Santa Fe and was quite captivated by the bronze figure of St. Francis in front of the church. Little did I realize then, that 16 years later he would emerge into my paintings. 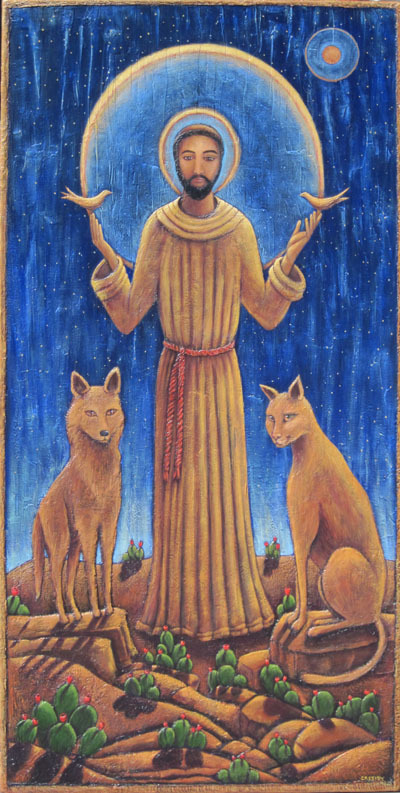 In this painting, the coyote and cat, guarding St. Francis to the left and right, also represent the balance of the masculine and feminine spirits within us. 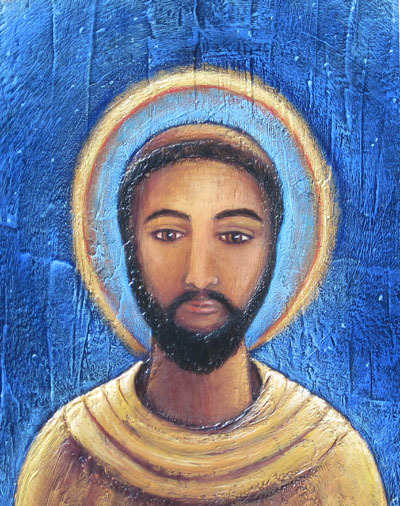 "New Mexico's third Spanish governor, Don Pedro de Peralta...founded a new city at the foot of the Sangre de Cristo Mountains in 1608, which he called La Villa Real de la Santa Fé de San Francisco de Asís, the Royal Town of the Holy Faith of Saint Francis of Assisi. In 1610, he made it the capital of the province, which it has almost constantly remained, making it the oldest capital city in what is the modern United States."